I'm a swing trader. That is what I do. But sometimes I can't find any decent setups to swing trade so I might try to find some stocks for a quick day trade. First let me say that I don't recommend doing this. Day trading is hard. You are competing with the best traders in the world! Second, let me say that you do not have to do this. If you can't find any stocks to trade then you can just wait for something to come along. Remember that staying in cash is a valid position. First I'm going to show you how I find these stocks and then how I trade them. How are these stocks selected? Stocks on the Move highlights stocks that had the greatest percentage increase in volume above their normal past daily trading level. 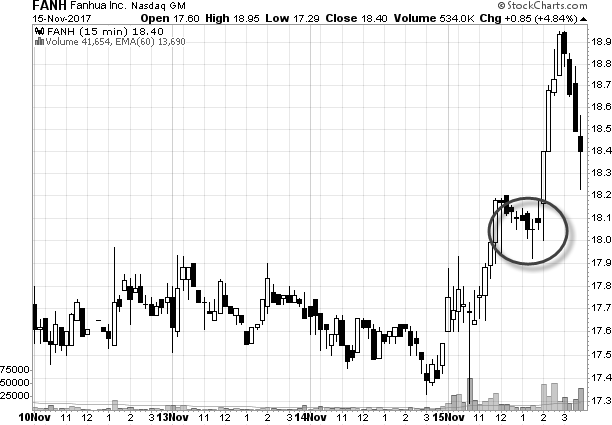 Usually a sign that institutions are buying or selling stock. 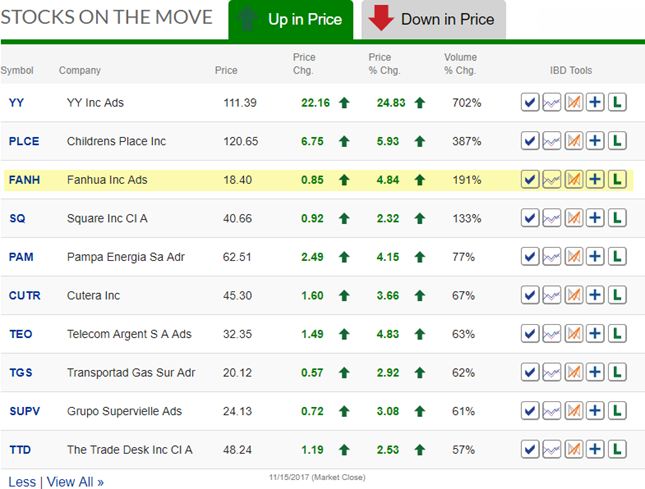 These are perfect momentum stocks for day trading. Heck, you could build a killer watch list of stocks for swing trading from the stocks on this list. And it won't cost you a single penny - just a few minutes of your time! Ok, that's cool. Now what? Why did you choose this stock to day trade over the others? 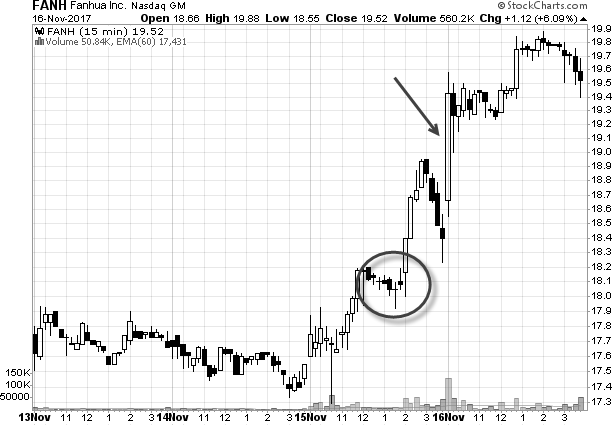 Because this stock offered the best pullback on the 15 minute chart (circled). This allowed me to get a low-risk entry. What's next? After you see a nice pullback on the 15 minute chart, then move down to the 5 minute chart to buy it at the best possible price. Note: You get extra credit if you recognized that this entry was a first pullback chart pattern! That is totally up to you. You can dump it at the end of the day or hold it for a day or two. According to the Connors Research Group, "It pays to hold positions overnight". That's from Short Term Trading Strategies That Work . Excellent book. I like to buy it during the day and dump it the next day at the open. I usually wait 10 or 15 minutes after the opening bell for the market to settle down from all the overnight orders coming in. The opening 10 minutes can be chaotic so you might get a bad order fill if you don't wait for a few minutes. Watching the bid-ask spread is smart. So let's say you buy a stock for a quick day trade. The stock goes against you. You might think to yourself, "This might make a good swing trade." So you rationalize holding on to it. Don't do it! Sell that stock and take the loss! Day trades and swing trades are totally different. I'm only telling you this because I have made this mistake before. More times than I care to admit! It almost never turns out good. If the stock goes in your favor - dump it. If it goes against you - dump it. Get in and get out. It's that simple. Sure you could set up multiple monitors, watch CNBC, and stare at Level II screens all day. Kill me now! That's too complicated and really boring. I like simple and fun. Trust me. This is a lot of fun!